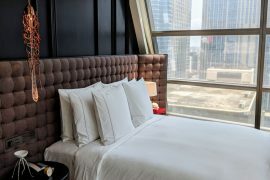 In April 2019, I checked into the Grand Deluxe Room at the newly-open The St. Regis Hong Kong, which is situated near Hong Kong Convention and Exhibition Centre and minutes away from Wan Chai MTR Station. 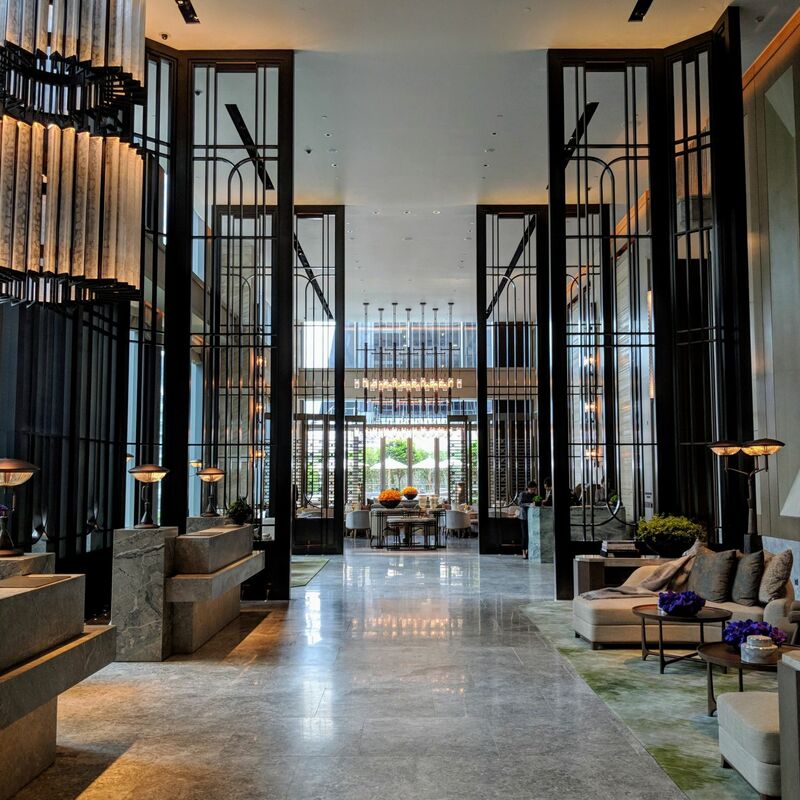 Designed by interior designer André Fu and his design studio AFSO (the people behind Andaz Singapore and Waldorf Astoria Bangkok), the 27-storey hotel houses only 112 rooms and 17 suites, an uncharacteristically boutique approach by St. Regis standards. 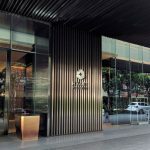 Aside from marking the debut of the iconic St. Regis brand in the Hong Kong luxury market and having the honour of being the 7,000th Marriott International property world-wide, the launch is notable for being one of the two highest profile luxury hotel openings in Hong Kong in recent years (the other being Rosewood Hong Kong, the flagship hotel of the ascendant ultra-luxury brand which opened just weeks before). 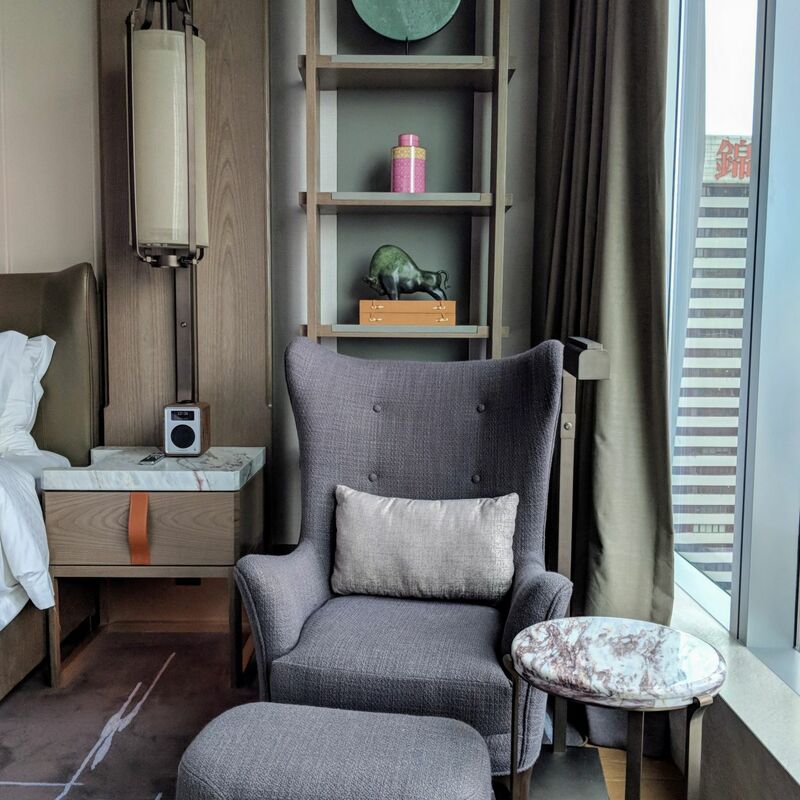 The UTW (“Under Ten Words”): Modern, residential luxury in Wan Chai. 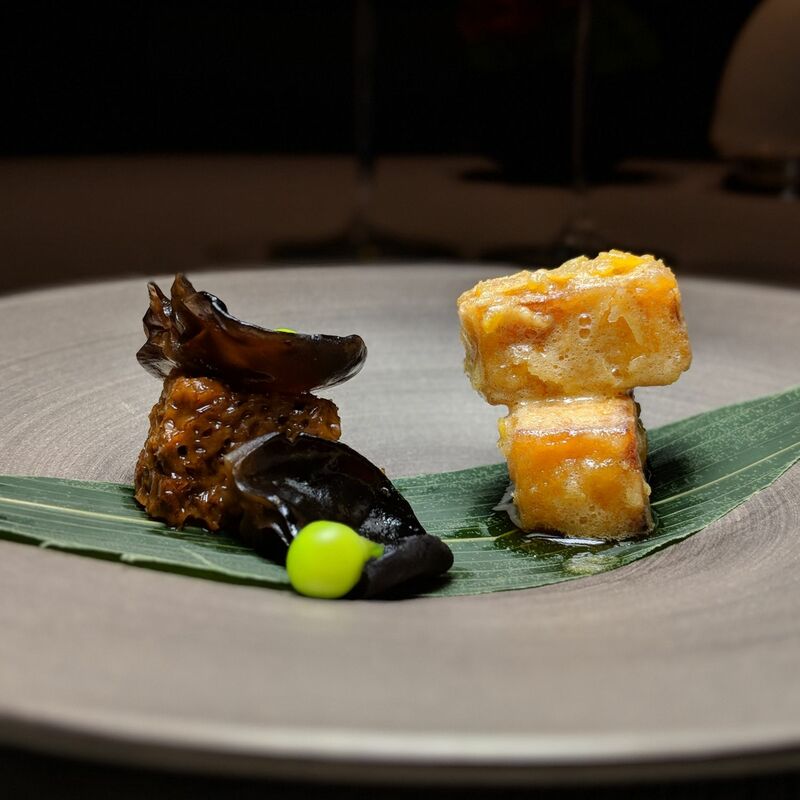 The must-dos (if any): Luxuriate in your room, take advantage of the bespoke butler services, dine at Rùn Restaurant. Eschewing the usual grand chandelier, grand hotel-esque showy opulence of the brand (think The St. Regis Singapore), The St. Regis Hong Kong instead adopts a decidedly quiet and residential approach, drawing design inspirations from both the city’s rich cultural heritage as well as the spirit of the original St. Regis in New York. 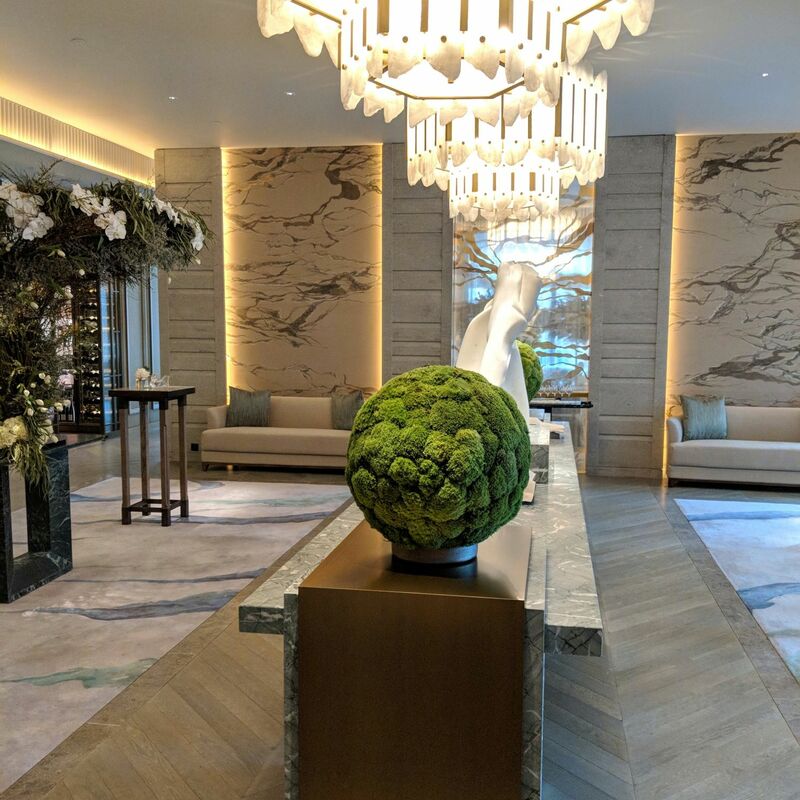 At the discreet ground floor lobby, guests will be introduced to their butlers and escorted one floor via elevator up to the reception area. Past the hotel’s signature grand staircase, guests will be greeted by the dramatically high ceilings – emphasized by the correspondingly soaring 7.5 metres-tall partitions on both sides of the hallway – and impeccably posh stateliness of the lobby area (an André Fu signature) which manages to capture the American-style, grand luxurious essence of the St. Regis spirit while simultaneously updating it to something more understated and contemporary. 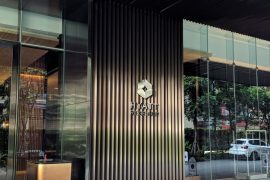 The St. Regis Athletic Club offers an expansive gym experience with state-of-the-art equipment, while the modest Spa (which interestingly has only one treatment room) doubles up as a retail space for spa products as well as St. Regis Hong Kong souvenirs (I wept silently as I bid the pair of adorable uniformed teddy bears adieu). 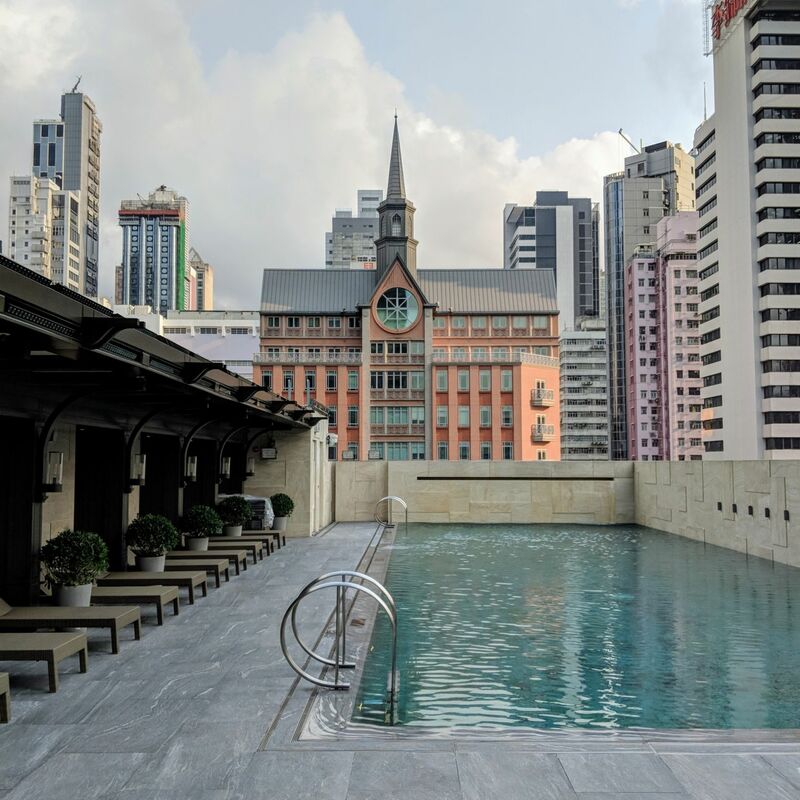 Elsewhere, The Verandah Pool & Bar comprises a heated outdoor swimming pool with a view of a beautiful high-rise church building across the street (dramatic steeple included to perfectly complement that broody Instagram pool photo with the contemplative, religion-tinged caption) as well as a poolside bar. At the time of this post, The Verandah Pool & Bar is not available to guests. 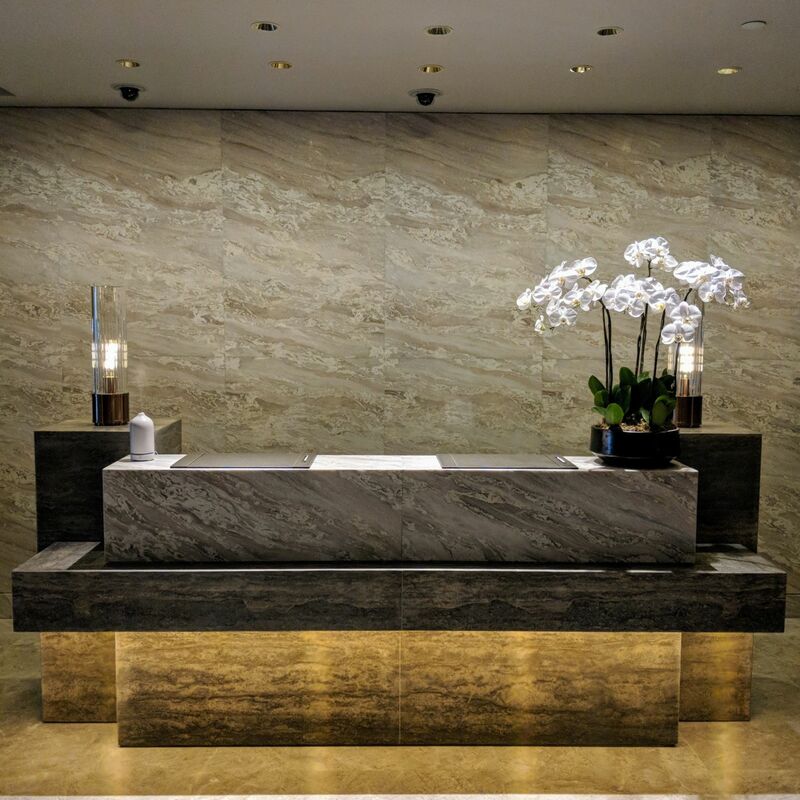 Ground Lobby (The St. Regis Hong Kong). 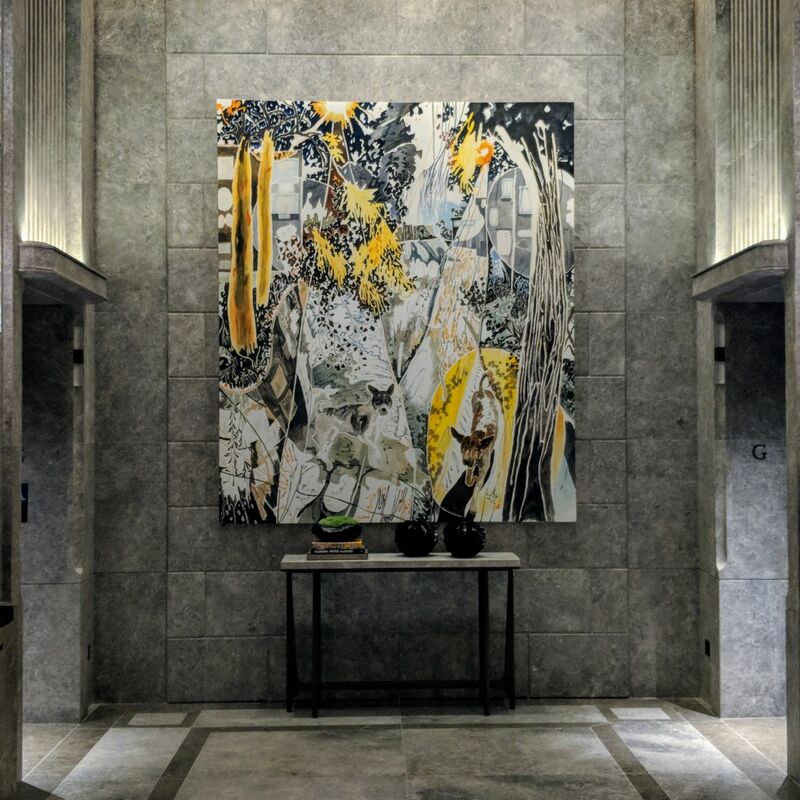 Lobby (The St. Regis Hong Kong). 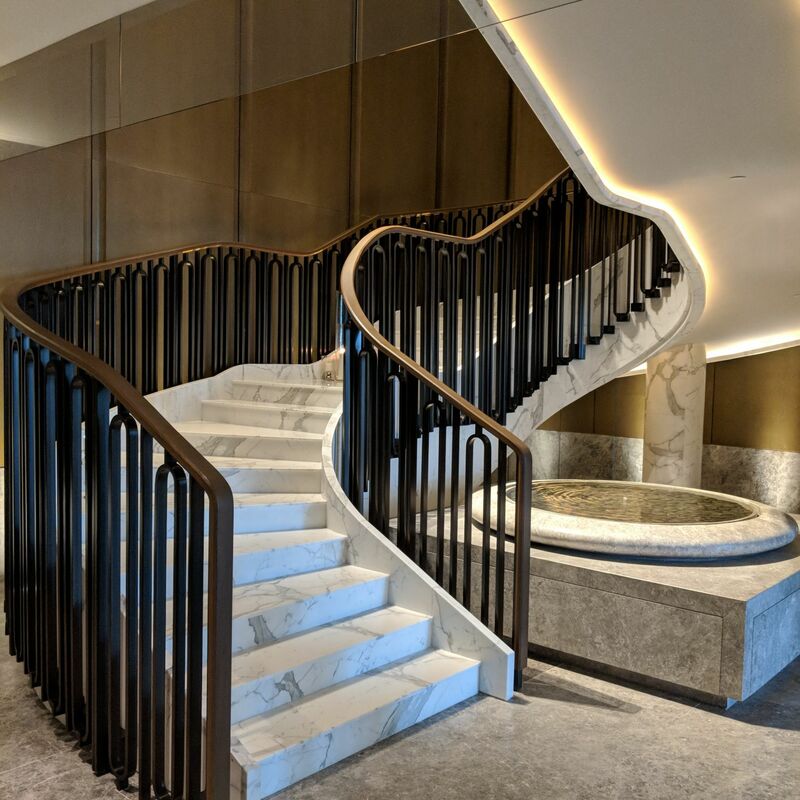 Spiral Staircase, Lobby (The St. Regis Hong Kong). 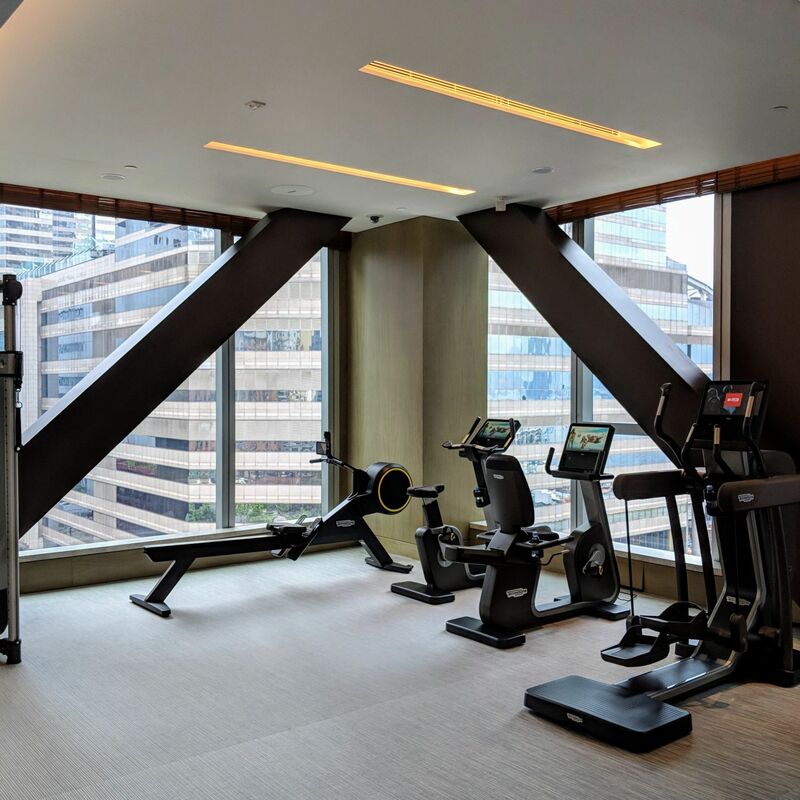 The St. Regis Athletic Club (The St. Regis Hong Kong). 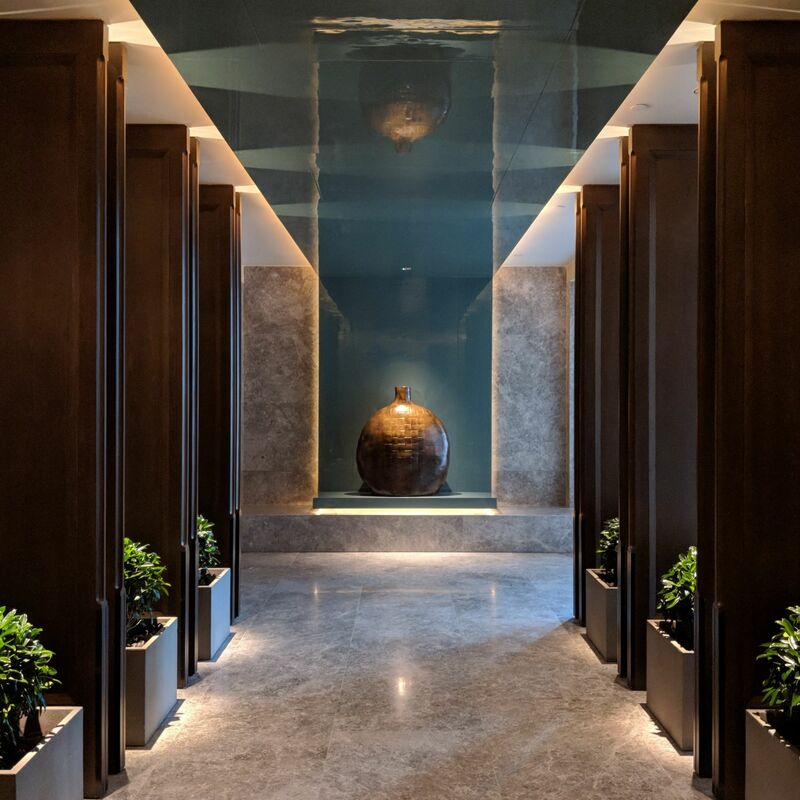 Spa (The St. Regis Hong Kong). The Verandah Pool (The St. Regis Hong Kong). 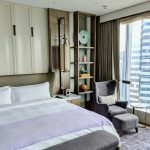 Surrounded by the mirrored exteriors of various high-rise office towers which dramatically reflect the hotel’s distinctive facade, the 50sqm Grand Deluxe Room plays it all Manhattan loft-chic informed by Hong Kong heritage, with its brass-accented woody inclinations reminding me strongly of Andaz Singapore. 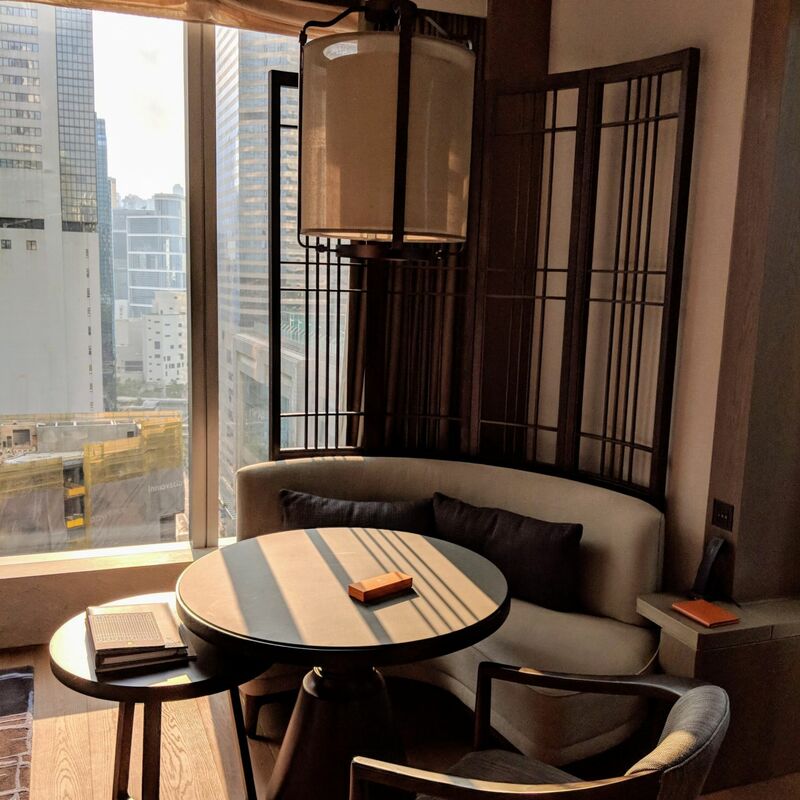 Despite it being only one category above the lead-in room category, the room feels comfortably spacious, with each area – from the curved booth couch (which doubles up as both a work desk as well as a dining table) to the window-side chair with ottoman ideal for pensive drinking whilst staring out towards the bustling Wan Chai district – being far enough from each other to feel like its own distinct space. 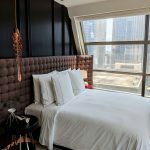 The 55-inch HDTV system is supported by a Yamaha sound system, while the pantry is equipped with a Nespresso machine capable of making milk coffee drinks (TWG tea sachets are also on hand if that is where you bend) and stocked with a variety of beverages and snacks. 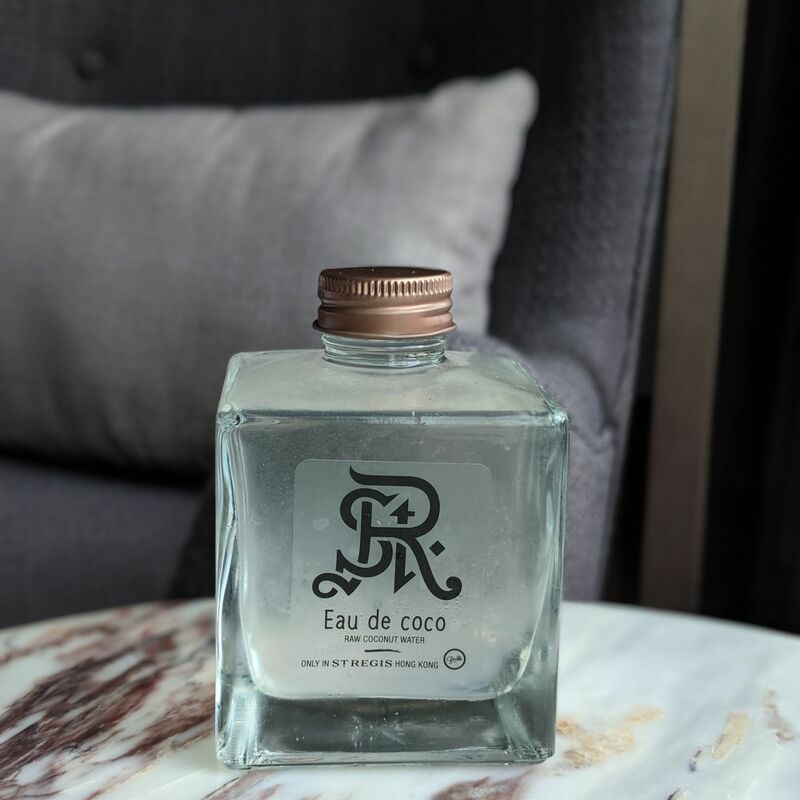 I was immediately drawn to the range of The St. Regis Hong Kong-branded drinks (the welcome drink resembles an expensive perfume bottle, and is charmingly labelled “Eau de Coco”) and spirits (gin, rum and vodka) which were bottled in partnership with Distillerie de Paris. Butlers can assist with preparing coffee, tea or hot chocolate by the pot upon request. 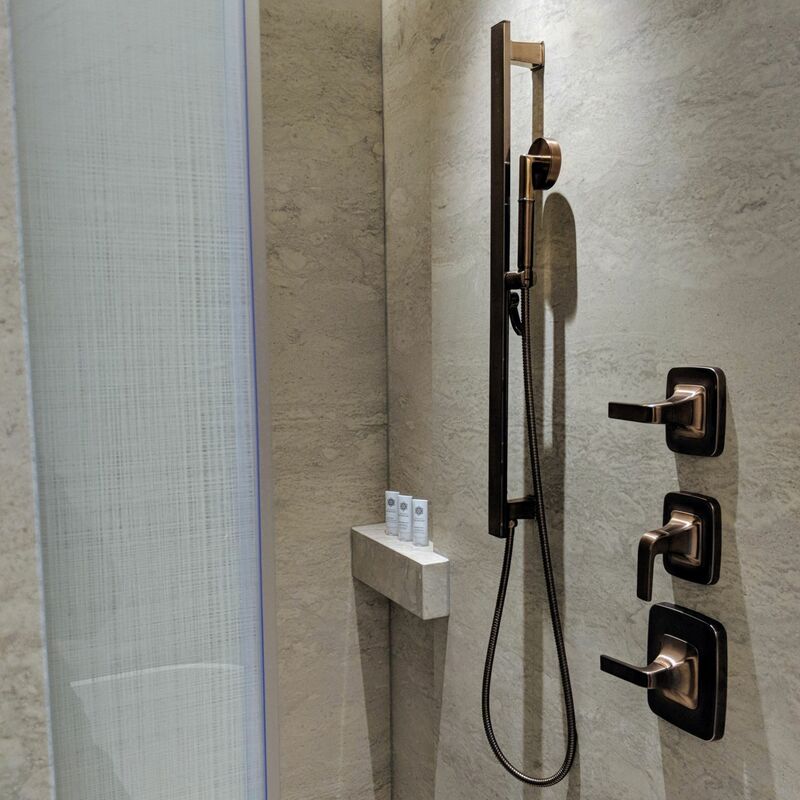 The bronze-accented bathroom features double vanities as well as a dresser with a connected hairdryer. 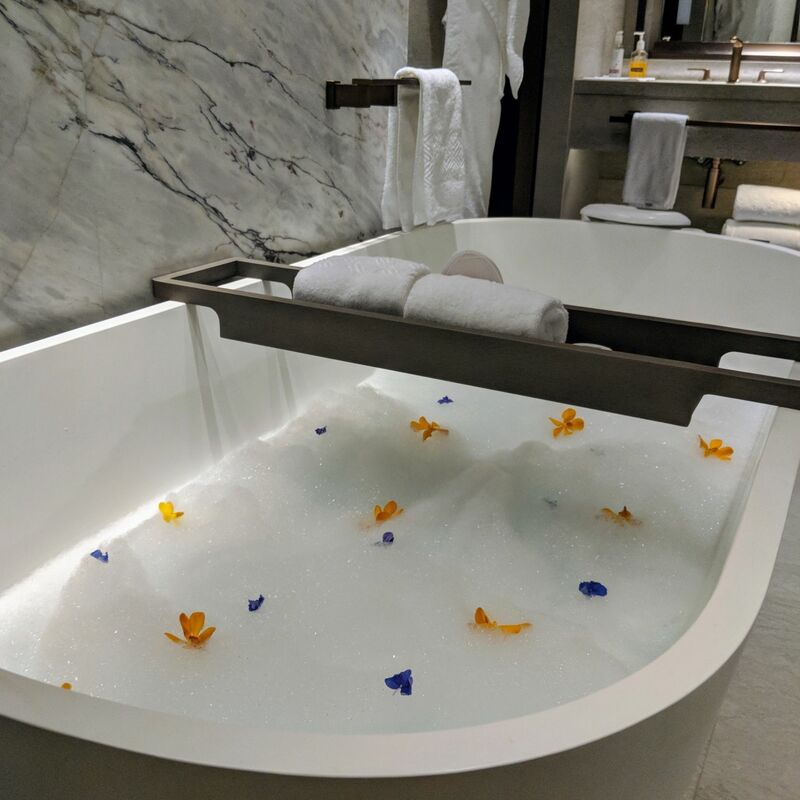 Guests luxuriating in the spacious freestanding bathtub (which they definitely should, as the butlers draw up a mean customised bubble bath) can enjoy daily news updates or the latest Chinese palace intrigues via the wall television set. 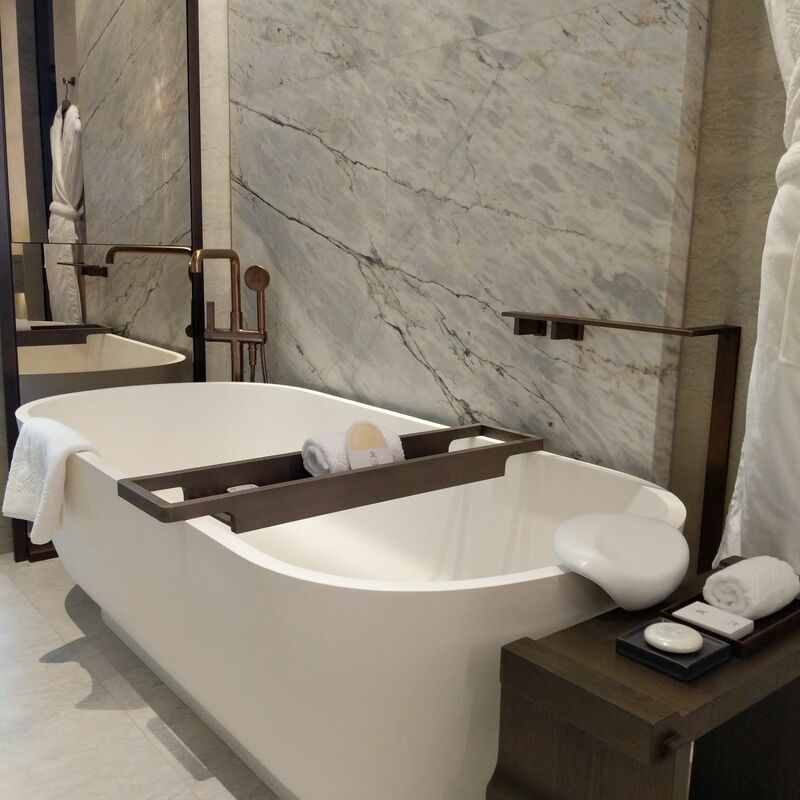 The cool, minty bathroom amenities are from the brand’s own Remède Spa concept (which I experienced at The St. Regis Singapore). I need to take a moment to commend the excellent service standards at the hotel. During my short stay, I received no less than five handwritten notes, four of which are from butlers and other housekeeping staff, in relation to the thoughtful little gestures on their part ranging from the offering of little St. Regis-branded bands for my charging cables to informing me of the safe delivery of my pressed articles of clothing and wishing I enjoy my meals at Rùn and The St. Regis Bar. I received a customised St. Regis Hong Kong notebook with my name embossed on the cover for being one of the first ever guests to check into the hotel. 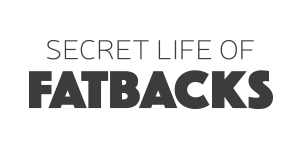 The butlers seem equipped and authorised to make quick executive decisions when it comes to service recovery, which I observed when there was an incident involving one of my dine-in reservations, and the efforts (are designed to?) seem very personal on the part of the butlers as opposed to being part of a management process, which makes things feel even more impressive. 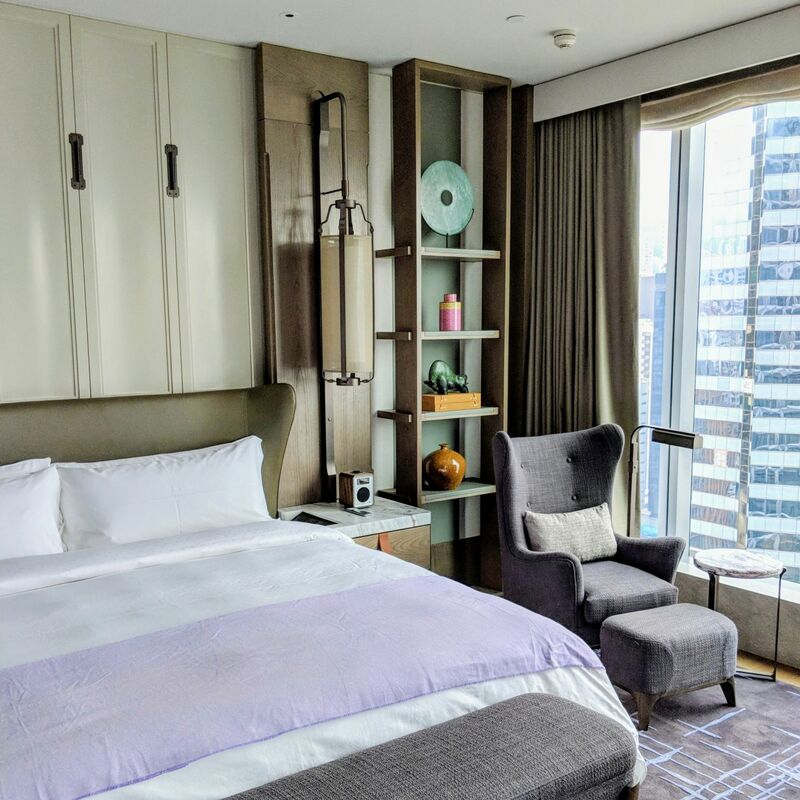 Grand Deluxe Room (The St. Regis Hong Kong). 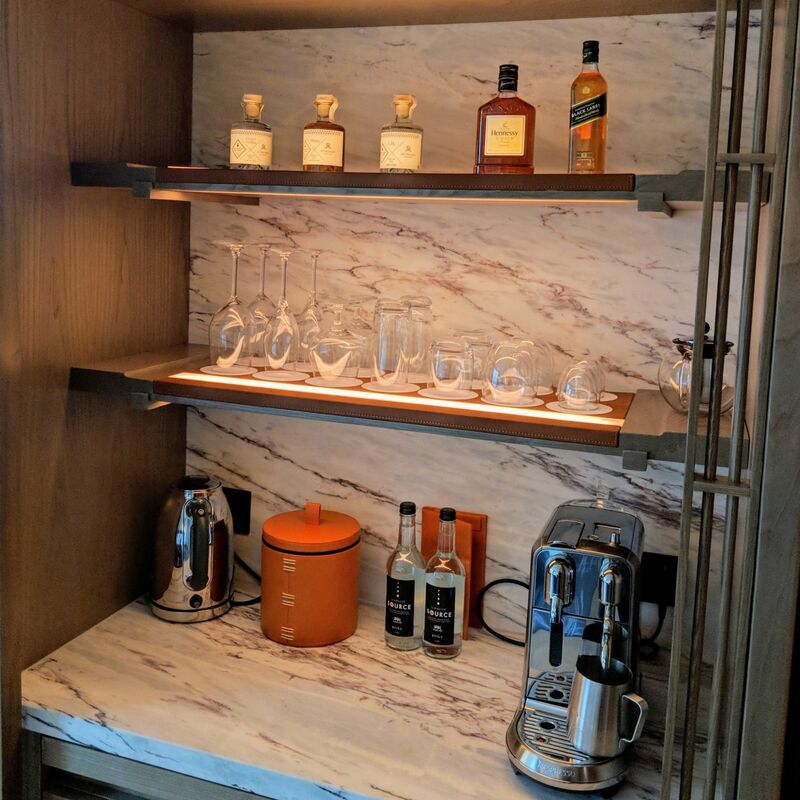 Pantry, Grand Deluxe Room (The St. Regis Hong Kong). 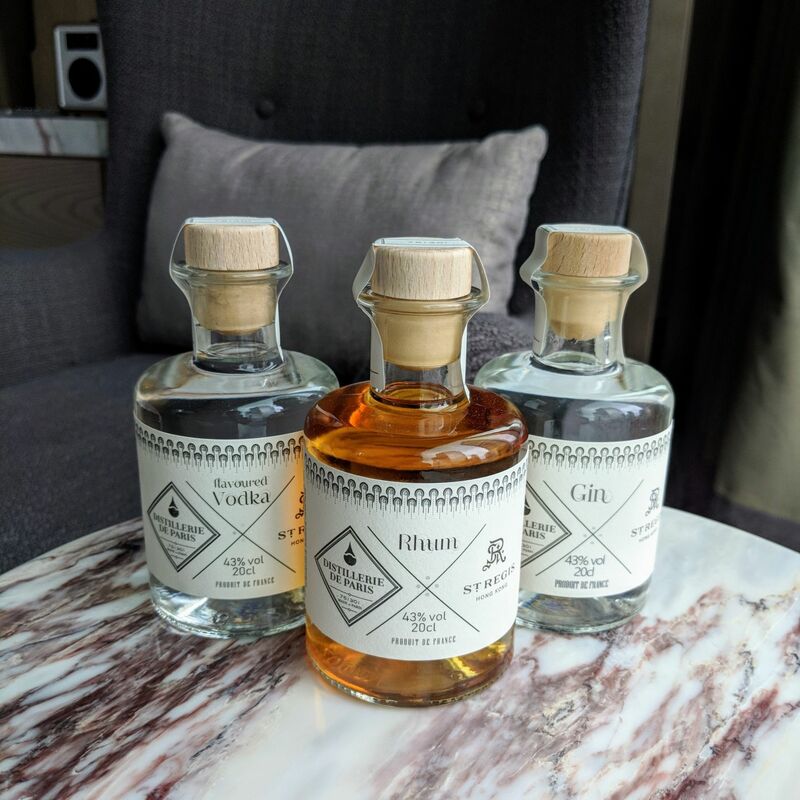 The St. Regis Hong Kong-branded House Spirits, Grand Deluxe Room (The St. Regis Hong Kong). 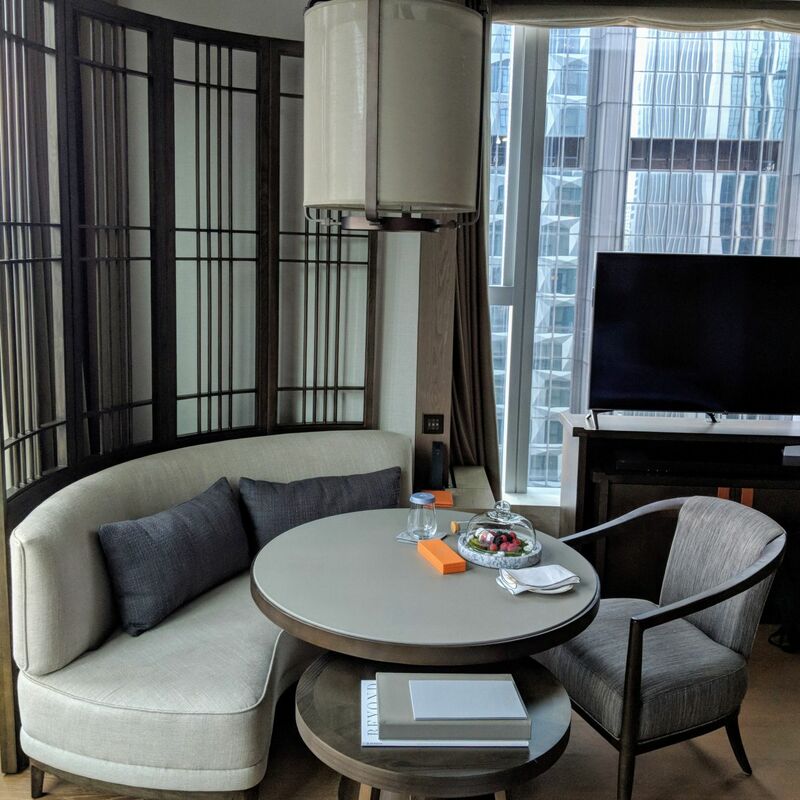 Welcome Amenity, Grand Deluxe Room (The St. Regis Hong Kong). 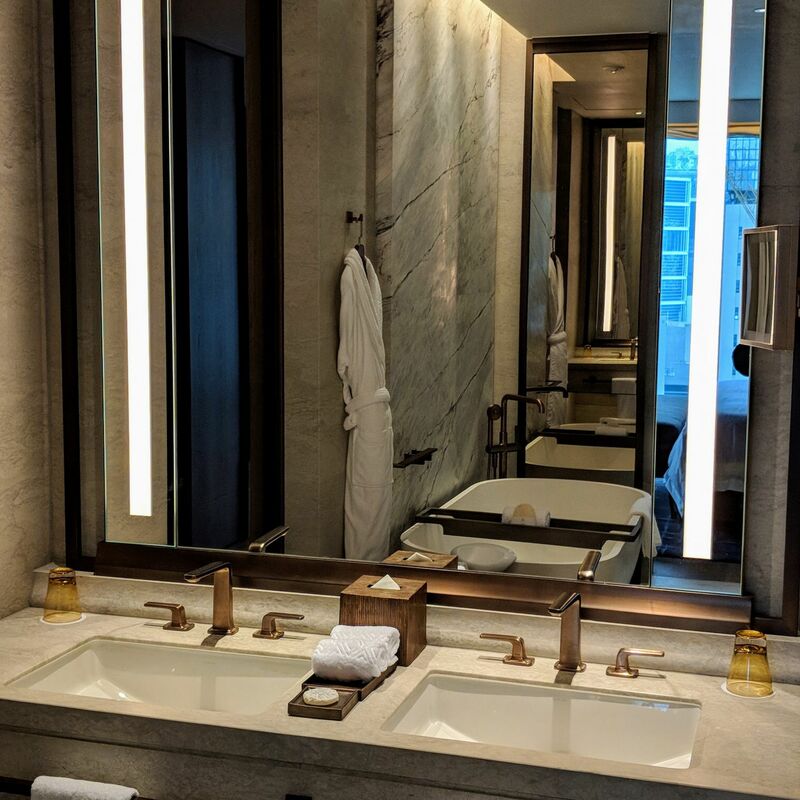 Bathroom, Grand Deluxe Room (The St. Regis Hong Kong). 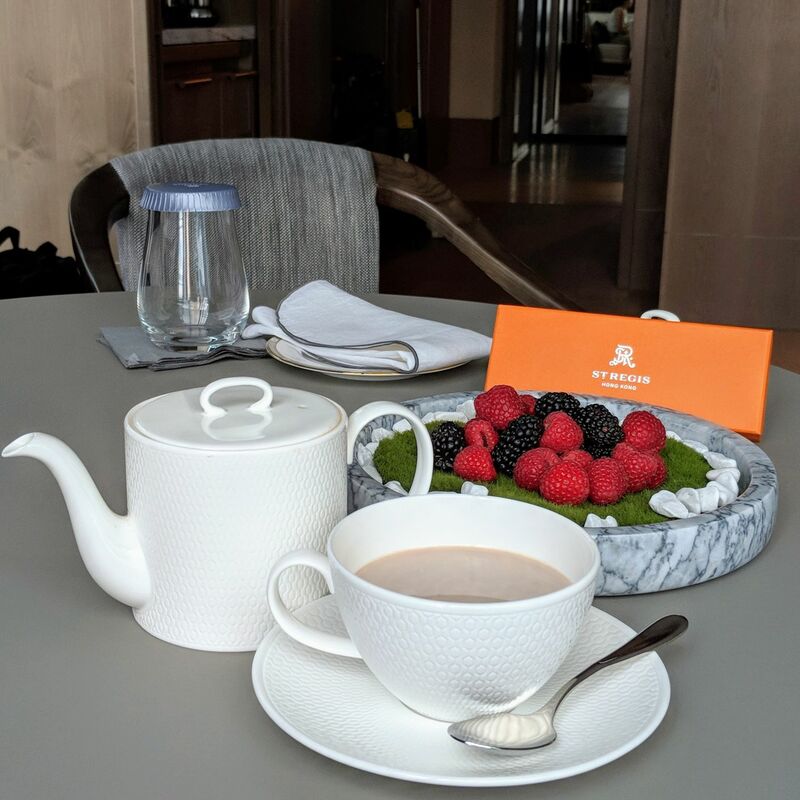 Butler Service Hot Chocolate, Grand Deluxe Room (The St. Regis Hong Kong). 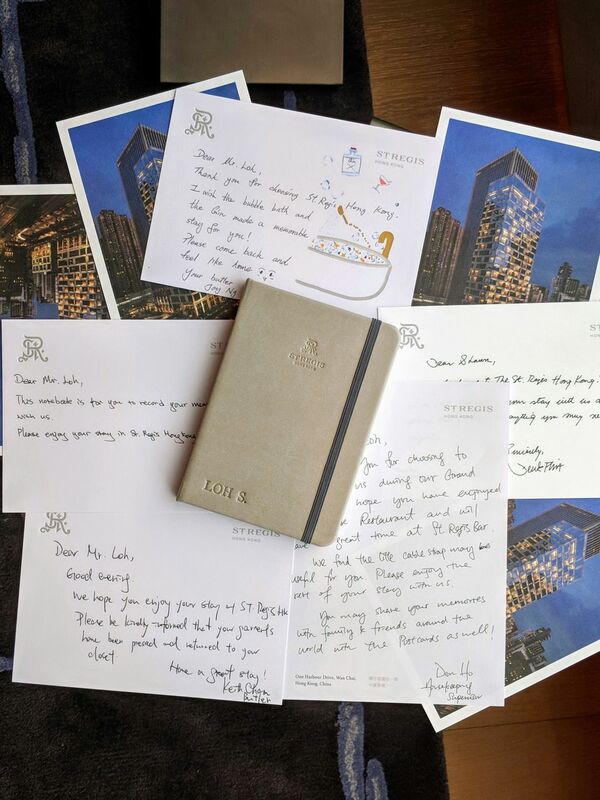 Staff and Butler Handwritten Notes (The St. Regis Hong Kong). 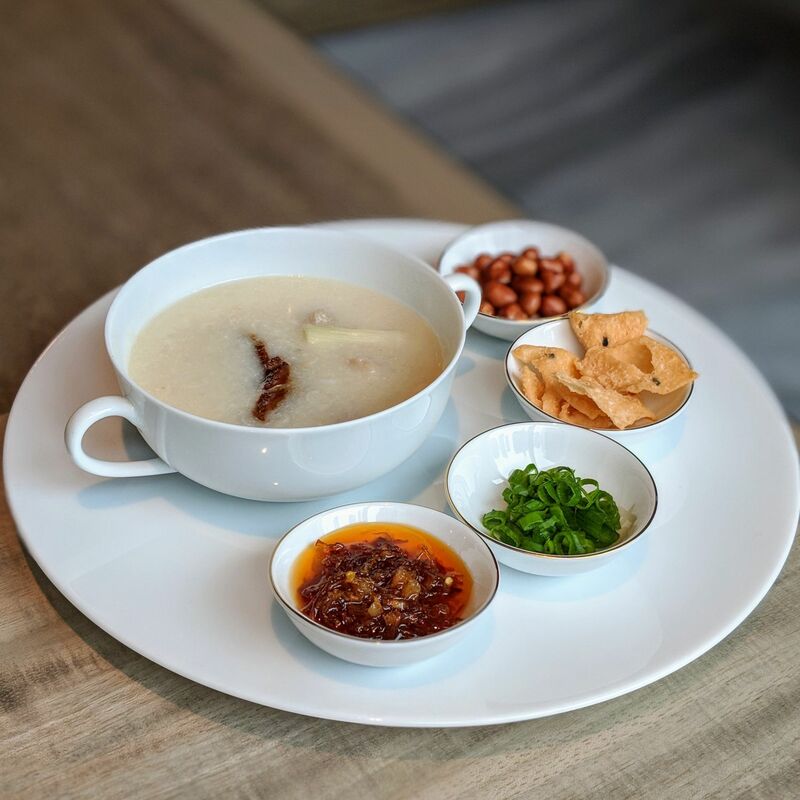 Breakfast is served at Rùn (pronounced “roon!” with emphasis), a signature Cantonese concept helmed by award-winning chef Hung Chi-Kwong which specialises in seafood and dim sum. 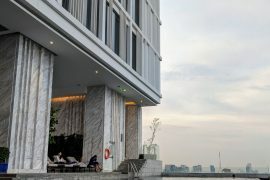 The semi-buffet is your standard selection of pastries, cold cuts, juices et al but guests can choose from Continental, Healthy, American and Chinese breakfast menus, with the latter three inclusive of exclusive a la minute offerings (smoothie bowls, egg dishes and dim sum delights respectively). As my reservation did not come with breakfast, we opted for some Chinese and Healthy a la carte offerings. The Red Fruits Smoothie Bowl was unadulterated Lululemon yoga pants, #eatclean goodness, with only the fruits lending any form of sweetness to the proceedings (the blackberries in particular were all sorts of wonderful), while elsewhere the Chef’s Dim Sum Platter consisted of various dim sum in individual bamboo steamers and the Abalone and Chicken Congee possessed a natural, likeable sweetness of flavour with both elements lending indulgent and earthy pleasures respectively. Rùn’s breakfast experience has nothing on its dinner menu, which was impressive and fairly all killer, no filler. We ordered the Deep-fried Lobster Spring Roll with Black Truffle Sauce (a stridently-perfumed treat which we should not have ordered in retrospect, given that it is also showcased in the Chef’s Dim Sum Platter), Barbecued Iberico Pork (a masterclass in dovetailing sinewy and melt-in-mouth fattiness), Roasted Crispy Pork Belly (shiveringly good in its salty agenda through both its crisp and chewy elements), Chilled Pink Guava Cream with Sago and Coconut Jelly (a passionate valentine to the fruit, and a revelation in the sense that I never had anything quite like this), Baked Egg Custard Tart with Bird’s Nest (the contents of your bite melt in your mouth helplessly, with the bird’s nest lending a most luxurious brand of sweetness) and Steamed Purple Sweet Potato, Chinese Yam, Layered Cake (which played it all pulut hitam meets kueh). The tea master’s accompanying Pu-Erh with Tangerine Peel was quite possibly one of my favourite Chinese teas ever. Situated on the lobby level, The Drawing Room is the hotel’s destination for afternoon tea as well as where guests gather for the hotel’s daily 5.30pm champagne sabering ritual is conducted, after which guests present will be served complimentary champagne. On the 3rd level and helmed by Michelin-starred chef Olivier Elzer, L’Envol delivers innovative French gastronomy by way of an open kitchen concept. Located behind The Drawing Room and featuring a dramatic mural by artist Chinese artist Zhang Gong behind the bar counter which pays loving tribute to Hong Kong, and primed to be one of the most photographed areas of the hotel, The St. Regis Bar delivers cocktails inspired by both Hong Kong and New York, with the brand’s signature Bloody Mary being a heavily Hong Kong-tinged “Bloody Canto” which includes Kowloon soy sauce as one of its ingredients. 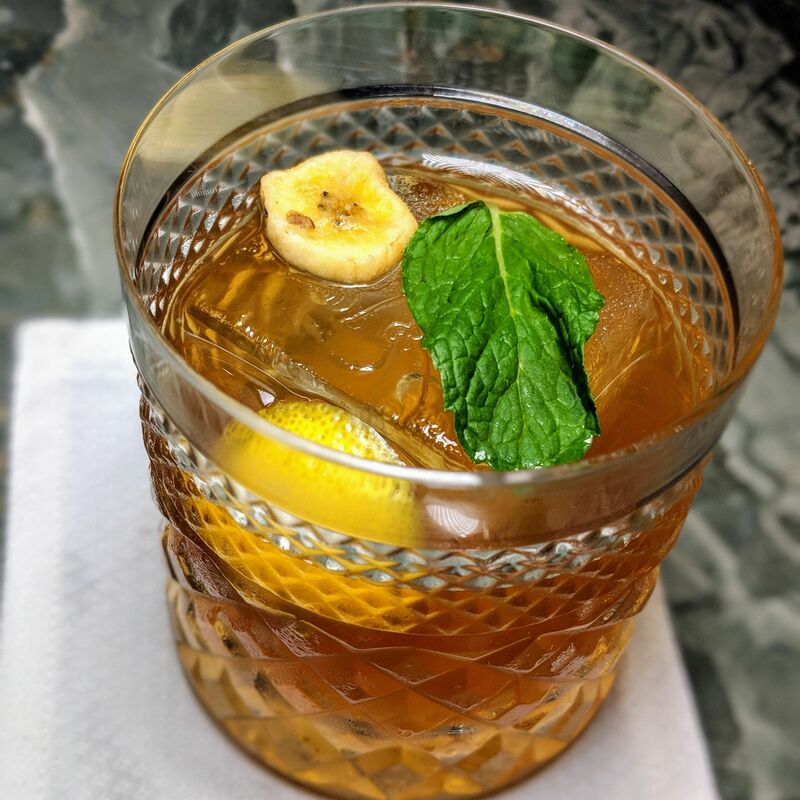 I requested for the most spirit forward selection from the New York menu, but the Willis Avenue (Jameson Irish Whisky, Toasted Oat, Banana, Stout Reduction, Fresh Lemon Juice, Clarified Dairy) came across more chocolate lemon juice than anything which would have brought me to home base. 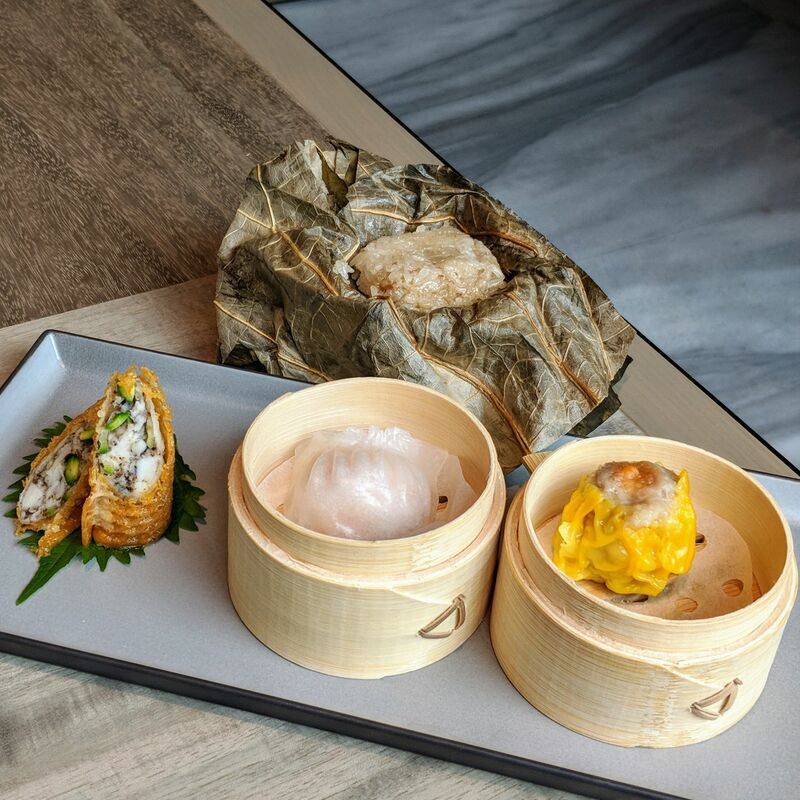 Chef’s Dim Sum Platter, Rùn (The St. Regis Hong Kong). Abalone and Chicken Congee, Rùn (The St. Regis Hong Kong). 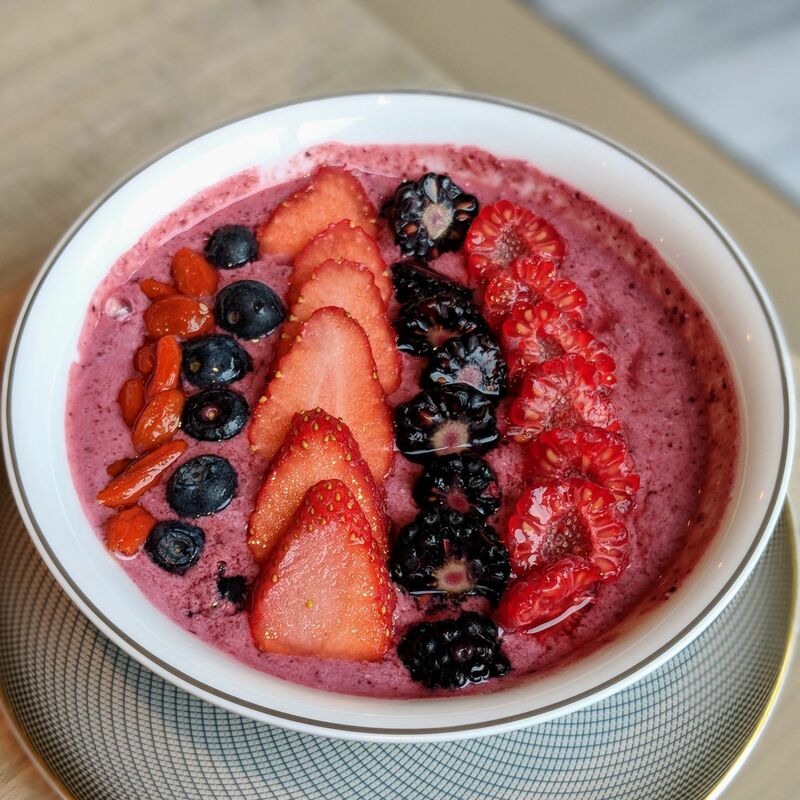 Red Fruits Smoothie Bowl, Rùn (The St. Regis Hong Kong). Welcome Snacks, Rùn (The St. Regis Hong Kong). 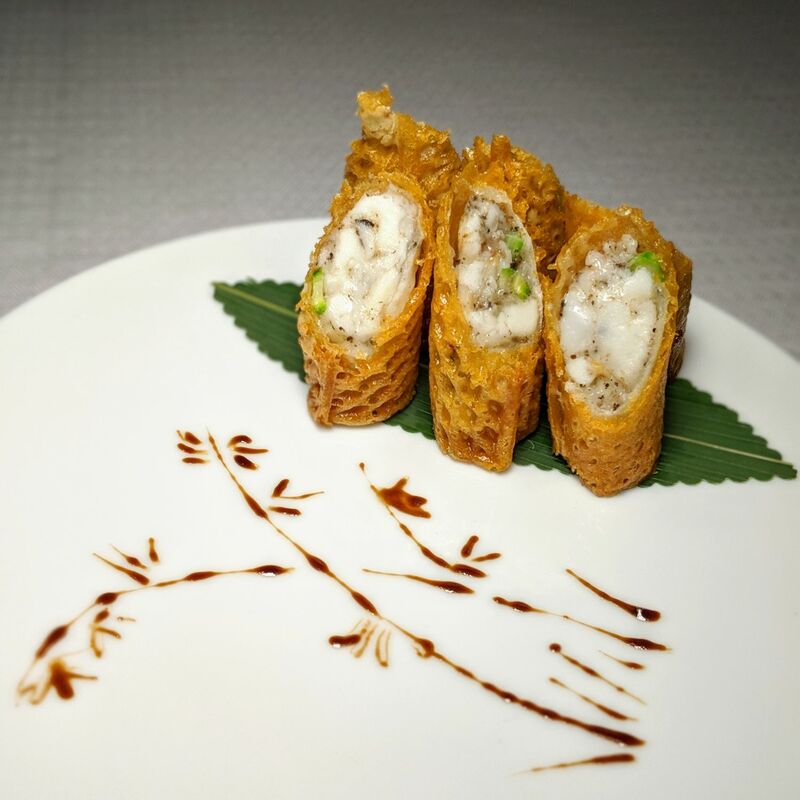 Deep-fried Lobster Spring Roll, Black Truffle Sauce, Rùn (The St. Regis Hong Kong). 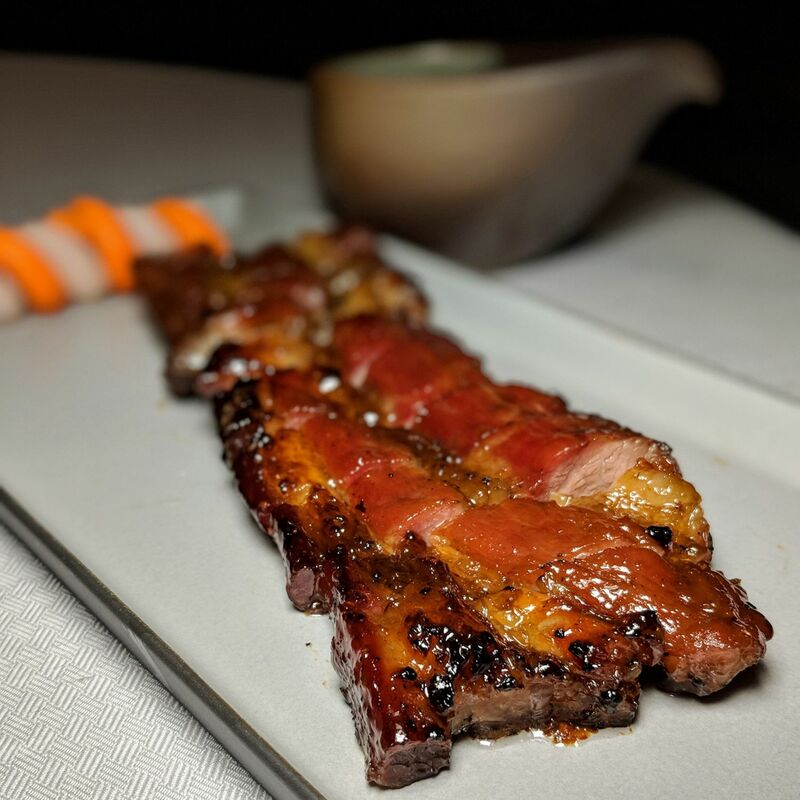 Barbecued Iberico Pork, Honey, Rùn (The St. Regis Hong Kong). 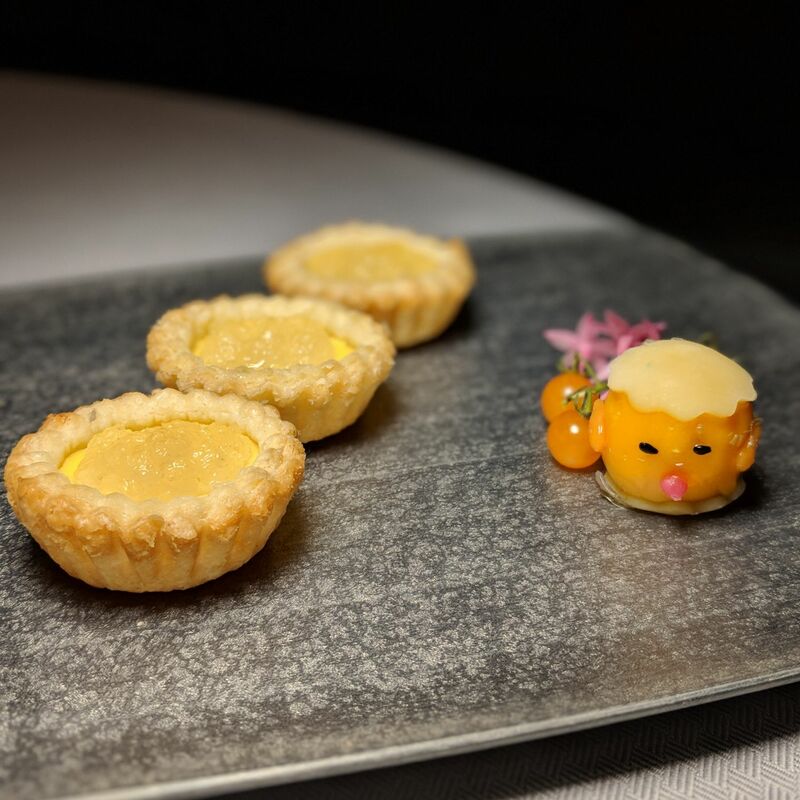 Baked Egg Custard Tart, Bird’s Nest, Rùn (The St. Regis Hong Kong). 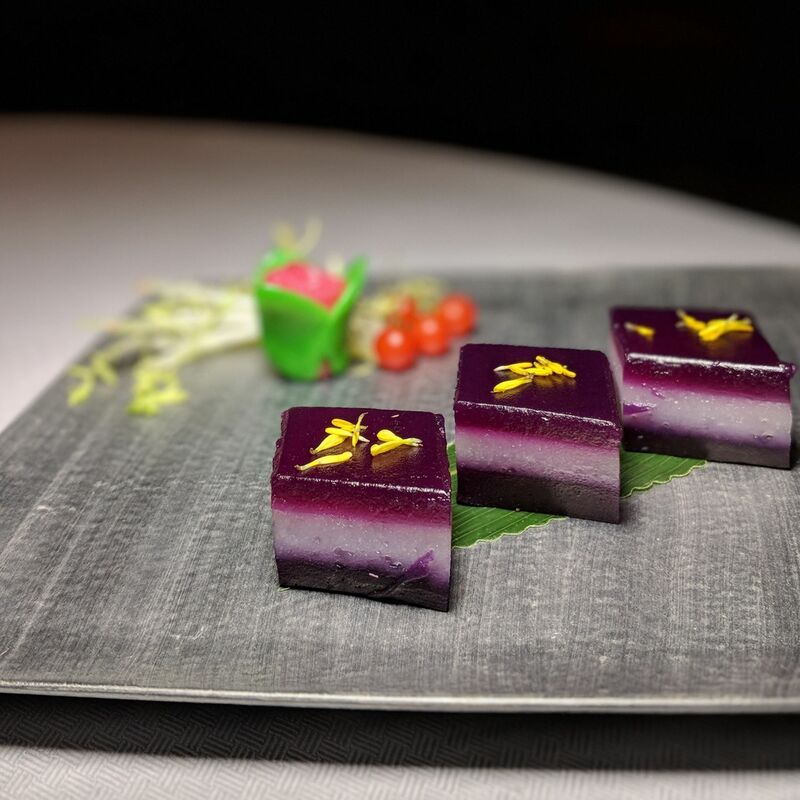 Steamed Purple Sweet Potato, Chinese Yam, Layered Cake, Rùn (The St. Regis Hong Kong). 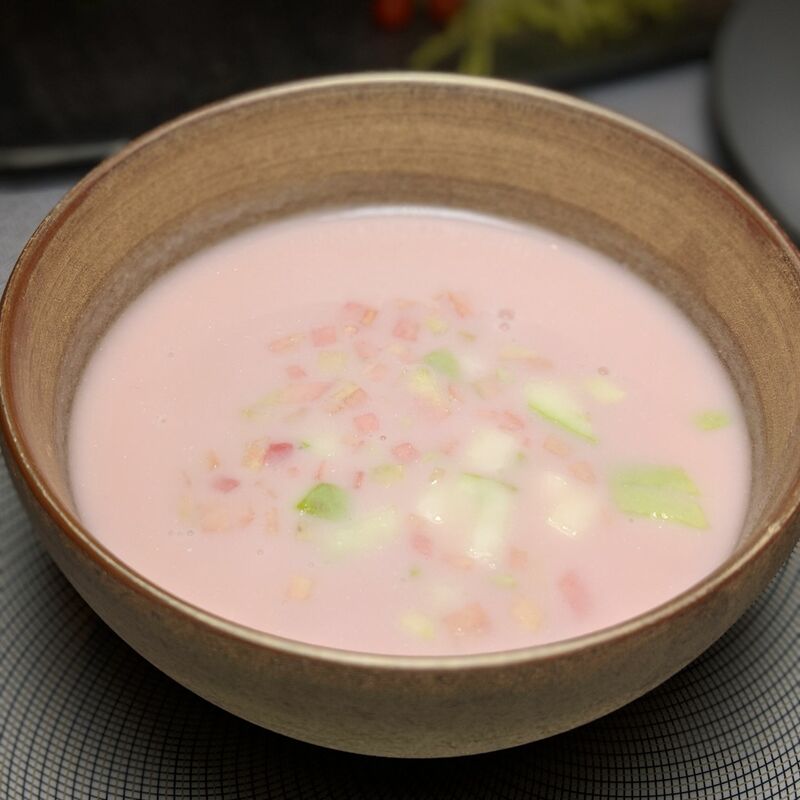 Chilled Pink Guava Cream, Sago, Coconut Jelly, Rùn (The St. Regis Hong Kong). 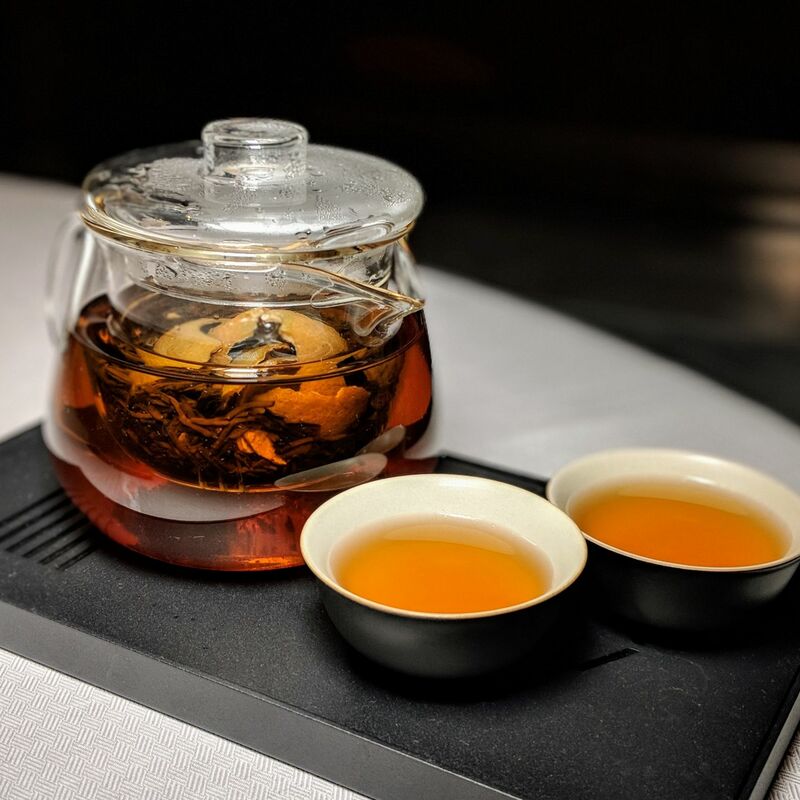 Pu-Erh Tea with Tangerine Peel, Rùn (The St. Regis Hong Kong). L’Envol (The St. Regis Hong Kong). 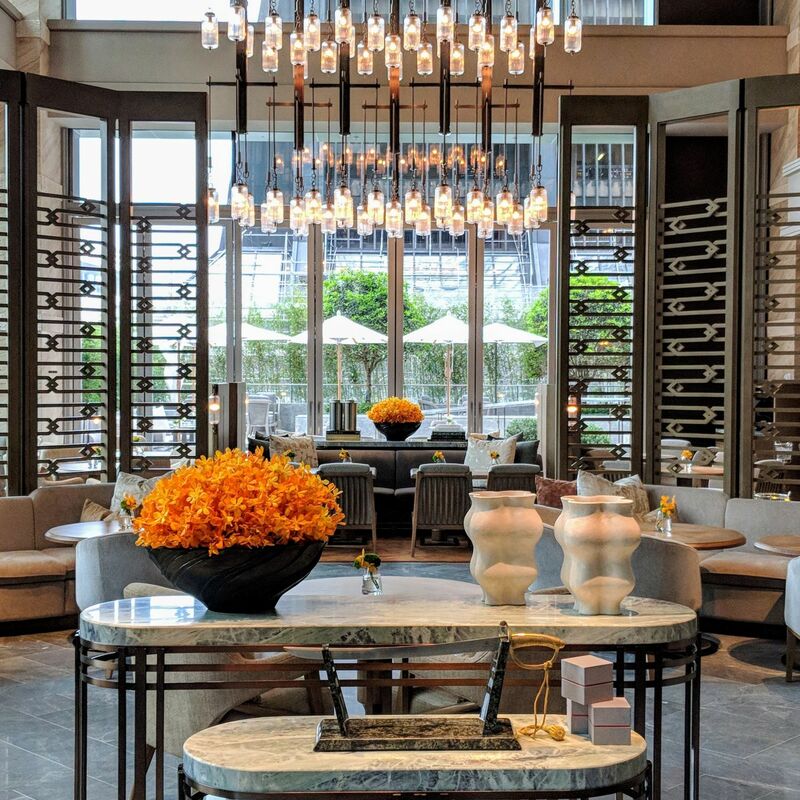 The Drawing Room (The St. Regis Hong Kong). The St. Regis Bar (The St. Regis Hong Kong). 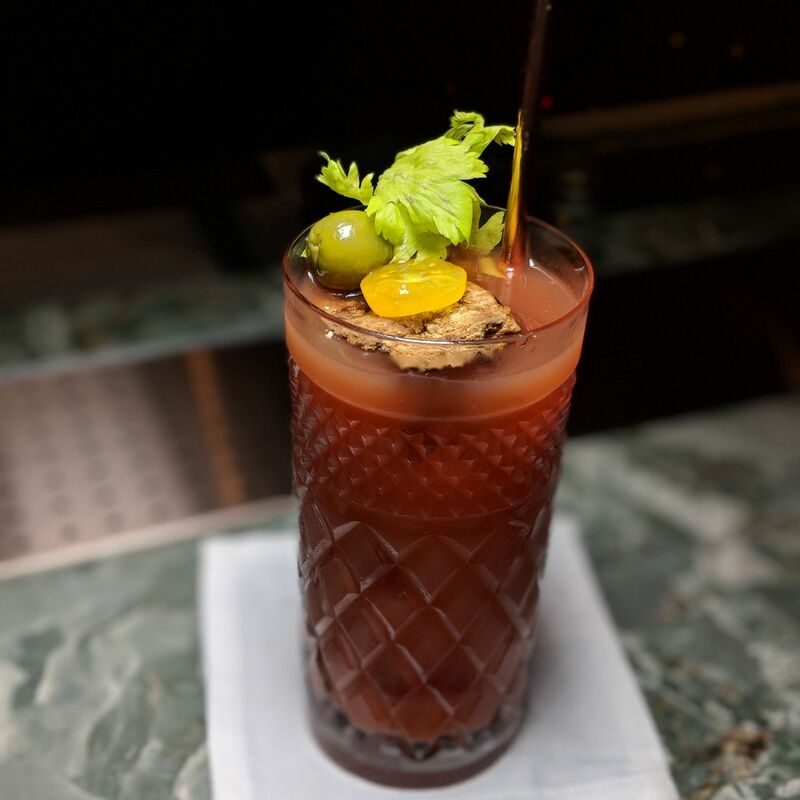 Canto Mary, The St. Regis Bar (The St. Regis Hong Kong). 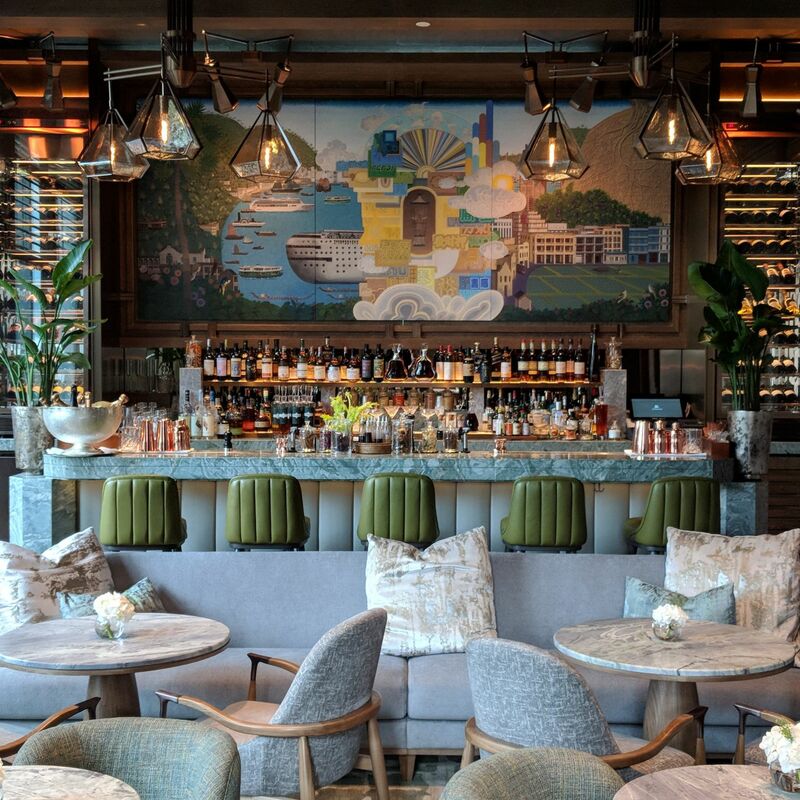 Willis Avenue, The St. Regis Bar (The St. Regis Hong Kong). 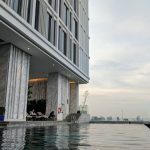 The hotel is a daring departure from the usual classic luxury stylings of the St. Regis brand both in spirit and in scope, ultimately playing it more like a contemporary luxury residence experience than an opulent, old-world grand hotel-style experience. Rùn is an absolute triumph, and I am pretty excited to try out the promising L’Envol someday. 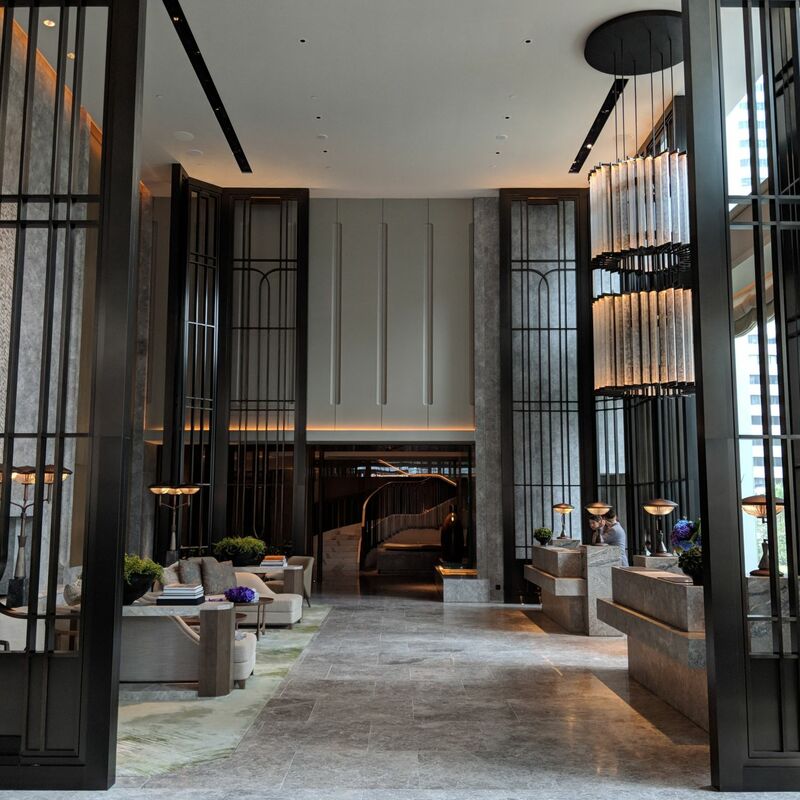 A notable addition to the Hong Kong luxury landscape.